Immaculately presented property located in a beautiful setting that affords breathtaking views from almost every angle. Rowan Cottage along with self contained annex, Rowan Berry, offers a comfortable family home along with a revenue generator, if purchaser so wished. Rowan Cottage is a well presented property which has had extensive upgrade works completed in recent years to include a change of layout to create the spacious property presented today. The property sits 90m above sea level and boasts stunning panoramic views of Loch Slapin and towards Loch Eishort. Rowan Cottage and Rowan Berry provide a comfortable family home with the annex, Rowan Berry, offering letting opportunities or alternative accommodation for other family members, such as a ‘granny flat’ or teenager quarters if purchasers so wished, the layout provides several options. Benefiting from UPVC double glazed windows and doors, the property is bright and airy with almost every window in the property affording outstanding sea views. A very generous well maintained garden area surrounds the property which is laid mainly to lawn and gravel and is also well planted with trees, bushes and shrubs with the 2 parking areas to either side of the property. The garden boasts a pergola which is supplied with power and lighting, a stunning feature where you can sit and take in the breathtaking scenery. A summer house also lies further up the garden. Currently set up and run as a B & B for last 25+ years although opportunities are endless, boasting a kitchen suitable for commercial use and flexibility of layout this property truly must be viewing to appreciate what is on offer. List of contents included in sale available on request. Entrance area with seating allowing a peaceful space to take in the tranquil views. Plenty room for removal and storage of outside clothing. Tiled flooring. Window to front and sides. Entrance through feature solid wooden door with glass window panels. Stairs off to first floor. Access through traditional 1/4 panel doors to Bedroom 1 and living room through to the rest of the property. Carpet. Currently set up as a twin room this room boasts an en-suite bathroom.Partial v lining. Laminate flooring. Stunning sea views through window to front. Radiator. En-suite comprising white W.C. wash hand basin into vanity unit, bath tub with shower over and tiled splash back. Click tile flooring. Window to rear. Towel radiator. Cosy room to sit back and relax. Fire place with electric stove although chimney could be re-opened (subject to the usual checks). Traditional 1/4 panel doors. Carpet. Window to front. Radiator. Impressive kitchen that has undergone upgrading to include multi fuel cooking appliances, new white goods and units. Ample wall and base cupboards with worktops over. The kitchen is suitable for commercial use and could prove very exciting for an aspiring chef. Sink with drainer. Wash hand basin. Island. Ray Burn. Range cooker with gas ring top and electric oven. Click tile flooring. Window to rear. Utility area with storage cupboard. Large intrigued fridge with separate freezer. Wall and base cupboards with worktop over. Intrigued washing and drying machine. Sink with drainer. Click tile flooring. Window to side and Upvc out to garden and Rowan Berry. Accessed from utility room. W.C with wash hand basin. Click tile flooring. Great space currently used as a pantry area. Access to Bedroom 2, Study and rear vestibule. Click tile flooring. Currently used as a single bedroom but could provide other use. Window to side. Radiator. Currently set up a study although could provide various uses. Laminate flooring. Window to front. Carpeted staircase leads to the upper floor and access off to 2 bedrooms and shower room. Houses fuse boxes. Window to front. Carpet. Currently set up as a twin room.Lovely views though window to front. Small fitted wardrobe. Carpet. Storage Heater. Double room boasting wash hand basin and vanity unit. Again, lovely views through window to front. Hatch to loft. Carpet. Storage heater. 3 piece suite comprising W.C. wash hand basin and corner cubicle with electric shower. Storage cupboard. Velux window to rear. Towel radiator. Vinyl flooring. 3 piece suite comprising W.C. wash hand basin and bath with electric shower over. Vanity unit. Window to rear. Towel radiator. Click tile flooring. Mezzanine bedroom currently used as a double. Partial v lining. Window to side. Carpet. Large garden with many features allowing places to sit and absorb the panoramic views on offer. Mainly laid to lawn and gravel with parking spaces to either side of the property. Well maintained and planted with trees, shrubs and bushes, and of course rowan trees! The pergola is a wonderful addition to the garden, fully fitted with light and power, the perfect spot for some al fresco dining. A large summer house rest further up the garden with a private seating area beyond. The garden hosts many setting which allow copious ways to enjoy the wonderful setting. Glasnkaille is a small, very friendly township situated in a beautiful part of the highlands on the shorelines of Loch Slapin. The area offers many outdoor pursuits or for those who prefer to just relax there is ample opportunity to absorb the ever changing views that the Loch and terrain provide, including regular glimpses of wildlife and birdlife. 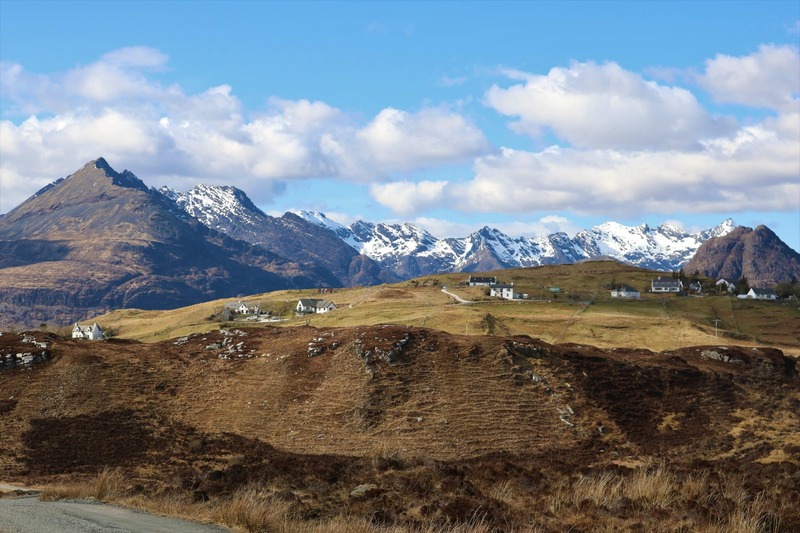 Located some 2 miles from the popular village of Elgol which boasts a good community spirit with the Community Hall offering functions that are well attended. In Elgol you will aslo find a small village shop and post office. Broadford is the nearest main village some 16 miles away, and offers amenities including a supermarket, shops, garage, hairdressers and modern medical practice. Primary schooling is available in Elgol with secondary schooling in Portree. There is a public bus that comes to Glasnakille three times daily during the week and once on a Saturday. Continue on A87 through Broadford. Take the turn off to Elgol and continue through Elgol, passed the shop and village hall and continue en route to Galsnakille. When you reach the junction at the phone box take a left and continue for around 200m, Rowan Cottage is the first house and lies on the left. Upper floor - two bedrooms and shower room. Self-contained annex Ground floor - vestibule, open plan sitting room/kitchen, bathroom. Mains Electricity. Oil fired central heating at ground level. Private water supply via bore hole. Drainage via private septic tank. Offers in the region of £290000 are invited and such offers should be submitted in proper Scottish legal terms to The Isle of Skye Estate Agency.